The winter and snow in South Park, CO disappeared quickly this late winter and early spring. Ice freed from the banks of the river and still water, while fish life was apparently abundant. Walking from the lower property bounds upstream I approached a large riffled run that flumed into an open deep pool known as “Beaver Crossing.” Upon approach with my 4wt R.L. Winston in hand rigged with a finely tuned nymph rig I began working this large slow moving pool. Suddenly, as I dropped my rig upstream at the end of the riffled run, waiting for my flies to sink and drop into the deep dark pool I noticed a large log like shadow move upward from behind a stick pinned boulder. As an initial reaction, thinking it was a massive brown trout, I quickly came to the realization that it was a dense and hefty northern pike. Reeling up my nymph rig and cutting it off at a thick section of my tapered leader I quickly tied on an olive size 4 Silvey’s Sculpin Leech with a no slip loop knot. According to this summary of thesis and study conducted by David E. Orabutt Jr., northern pike were first introduced into eight premier Colorado trout fisheries. One of those eight fisheries being Tarryall Reservoir, approximately 5 miles upstream of the Historic Williams Ranch. Every late spring and early summer runoff season, the occasional northern pike get swept over the spillway of Tarryall Reservoir and enter the Tarryall Creek and adjacent properties. As northern pike can grow large due to their aggressive predatory nature, they can wreak havoc on small trout fisheries. Here at the Historic Williams Ranch we have an eradication policy of northern pike. Although pike are a gas to catch, these river thugs can clear out its resident pool within a matter of months. We encourage every angler and guest of the HW Ranch to immediately remove all northern pike caught. 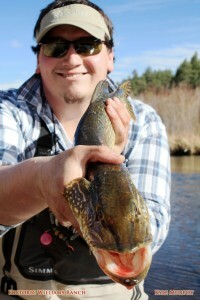 This entry was posted in Fly Fishing and tagged Fly Fishing, Norther Pike, Tarryall Creek, Trout. Bookmark the permalink.